As part of your support offering to customers, it may be necessary for your techs to personally visit the customer’s premises, look into the request and resolve it. In such cases, your techs need to have prior information on the customer and the ticket he/she raised. 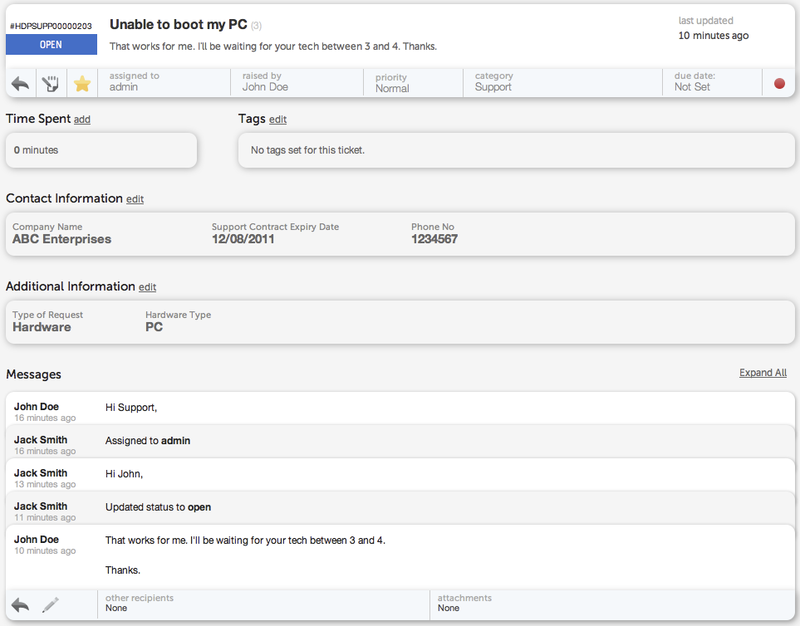 Within Helpdesk Pilot, the ticket is displayed with relevant customer and ticket specific information as well as the communication exchanged between the customer and your support staff, in a conversational view. This format looks great when viewed on your support staff’s 17″ LCD screen, but techs in the field need a simple template to work with. Each ticket can then be printed in A4 format and handed over to your techs in the field, for use during their daily support calls. Going one step further, the print view can be exported in a PDF format and used as a more concise, digital version of the original ticket. Many organizations now outfit their techs with tablets (such as the iPad) in a move to be more environmentally friendly. Therefore, techs can easily download their assigned set of service requests and refer to them whilst in the field, doing away with the need for actual paper based printouts. This entry was posted on Monday, October 3rd, 2011 at 1:00 pm	and is filed under Helpdesk Pilot. You can follow any comments to this entry through the RSS 2.0 feed. You can leave a comment, or trackback from your own site. Helpdesk Pilot is a product of the technology driven folks over at Tenmiles Technologies, who enjoy creating web based software that makes life easier for everyone using them. From Chennai, India. 2005 - 2013 Tenmiles Technologies Pvt Ltd. All Rights Reserved.